Pakistan is to elections in India what Russia is to elections in the U.S. 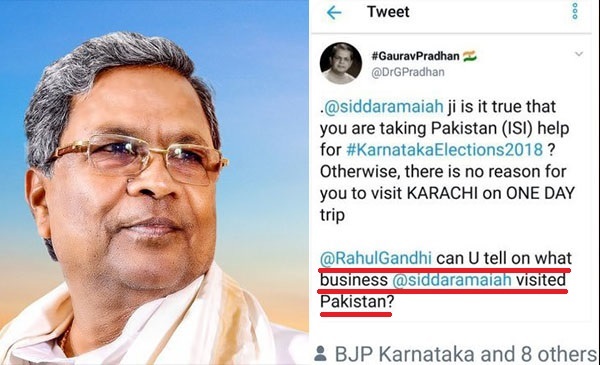 The ghost of Pakistan meddling in Indian state elections made a comeback on Twitter when several users shared a letter by an aviation company that claimed to show Karnataka Chief Minister Siddaramaiah and Congress leader Zameer Ahmed traveled to Karachi, Pakistan on April 13, 2018. The letter was shared by several Twitter handles seeking an explanation from the chief minister on his visit to Pakistan ahead of an important assembly election. One such handle was @DrGPradhan who has over 1.23 lakh followers and has been caught several times in the past by BOOM for spreading fake news. 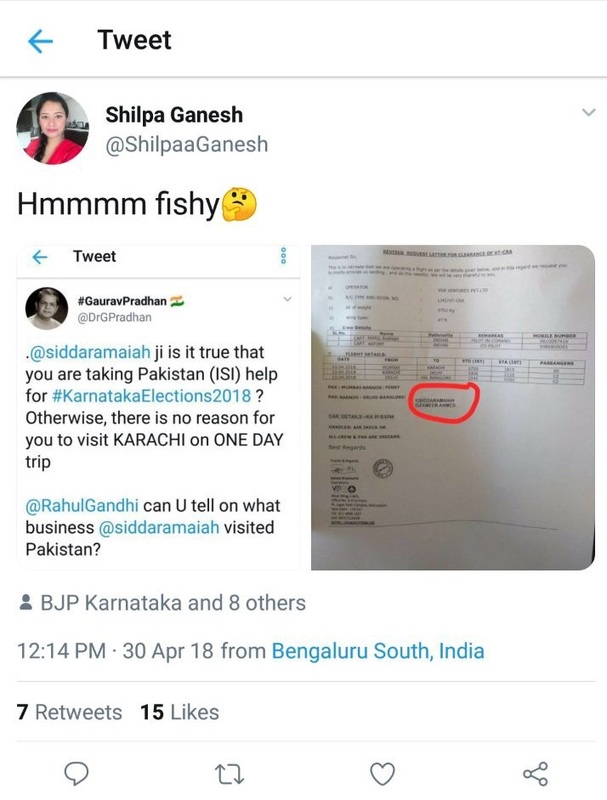 As Congress supporters raised a stink over the letter calling it fake, @DrGPradhan deleted his original tweet, changed tack and called it fishy. The letter dated April 10, 2018, addressed to Bangalore HAL (Hindustan Aeronautics Limited) sought to inform the airport that the private aviation operator VSR Aviation would be operating a flight on April 13 which would leave Delhi at 5 pm and reach Karachi at 6:15 pm. The flight would have no passengers. The flight would then takeoff from Karachi at 7 pm and return to Delhi at 9:10 pm with two passengers. The flight would then leave Delhi airport at 11:45 pm and reach Bangalore HAL at 2 am on April 13. It is important to note that the while the date of departure from Delhi airport is mentioned, the letter does not mention the arrival date. The letter is signed by one Ashish Bhadouria from the Operations team at the VSR group. BOOM got in touch with Ashish Bhadouria who said that there is no truth to the letter and the information is totally fake. Bhadouria also insisted that none of their charter flights have flown to Pakistan in the last few months. 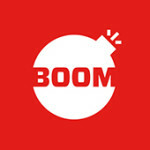 BOOM has not been able to independently verify this claim. 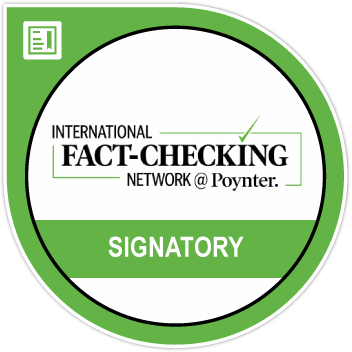 BOOM also got in touch with the Karnataka chief minister’s office who refuted the claim. One of the personal assistants of the chief minister said that Siddaramaiah was in Delhi between April 11 to April 13 for several meetings with Congress leaders including Rahul Gandhi. A search on Truecaller of the numbers mentioned of the Pilot-in-command and Co-Pilot revealed different names and not of Capt. Rahul Sharma and Capt. Antony as mentioned in the letter. Our calls to these numbers went unanswered. Meanwhile, Congress spokesperson Brijesh Kalappa has sought a CID inquiry on where the letter originated from. BJP Dirty Tricks Department is active. VERY ACTIVE. Forging documents that show that @siddaramaiah and Shri Zameer Ahmed flew to Pakistan.